Give your front line workers the best experience with this high quality six-linebusiness media phone. The VVX 300 improves personal productivity by complementing the workplace applications on their computer. Users can view and manage their Microsoft Exchange Calendars, receive meeting reminders and alerts, access the corporate directory and Instant Messaging/presence status right on their phone display, even while waiting for their PC to boot. They can also extend their PC’s desktop to include the VVX 300 phone’s screen for mouse/keyboard navigation and interaction. 1. 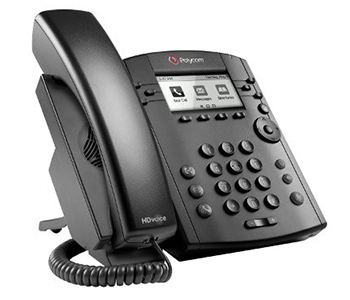 To enjoy all the benefits of Polycom HD Voice when using the phone in the headset mode, you must use a wideband headset. 2. Most software-enabled features and capabilities must be supported by the server. Please contact your IP PBX/Softswitch vendor or service provider for a list of supported features. Download the YipTel Polycom VVX 300/310 HD Datasheet (PDF).